Anyway on a recent trip to Poundland and I got heaps of bargains, and amongst my little haul I also got these two lovely candles which are up first to be reviewed. Both of these were a pound (doh!) and I’ve seen on eBay and on Amazon that they sell for about £5 on both of those sites. See? Bargain. 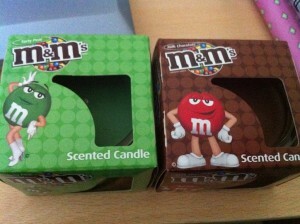 Both of these are good quality, fragranced candles and for the novelty value alone as I know lots of people who love the M&M chocolates these are a great gift. I can’t believe summer is over, well it’s not like we ever really had one, but you know what I mean. I actually don’t mind that it wasn’t a super hot summer because I prefer autumn/winter time. Cooler weather means woolly cardis, the smell of crisp brisk air, leaves changing to beautiful vibrant colours and the comfort of evenings spent snuggled up on the sofa with lots of warm blankets and getting to light lots of candles earlier in the day…pure bliss. 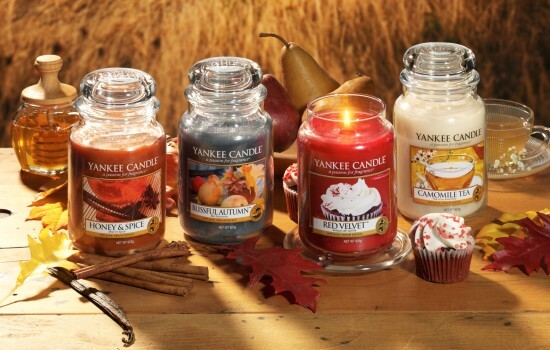 Have you tried this season’s new heavenly scented candles from Yankee Candle? I popped into Heatons yesterday just for a look around, but with me and with any shop, a look around isn’t just a look around and I always end up buying something or lots of things. I was immediately drawn to the home section with a pretty good selection of candles. I found these cute little candles for only €2 each. They had lots of different scents and I nearly bought all of them but I decided just to get Fresh Blueberry, Lemon Drop and Sugared Raspberry (which smelled exactly like Black Forest Gateau) I thought they were so cute as they came in little miniature Mason jars. 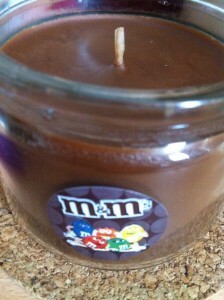 But sadly I was not at all impressed with my candles. I thought I might’ve trimmed the wick too short which can happen so I lit the Fresh Blueberry one without trimming the wick and the same thing happened again, the wick just disappeared, burnt away. So I was left with lots of wax and no wicks. I’ve bought and burnt many a candle in my day, I know what to do and what not to do, and this has never happened to me before.